Today's gift idea is Pouches to fill with fun stuff! Pouches are great for using up darling scraps of fabric and can be made in any size. My favorite pouch tutorial is here. This idea was conceived when I received this darling pouch from Julie the Crafty Quilter and wanted to make one right away. Stop by to see wonderful things by The Crafty Quilter! I made my pouches a little larger (finishes at 6 x 9"), so they can hold some Easter treats. This is the second pouch I made. This time I added some ribbon and buttons for extra cuteness! The plan is to make a pouch with these fabrics next! 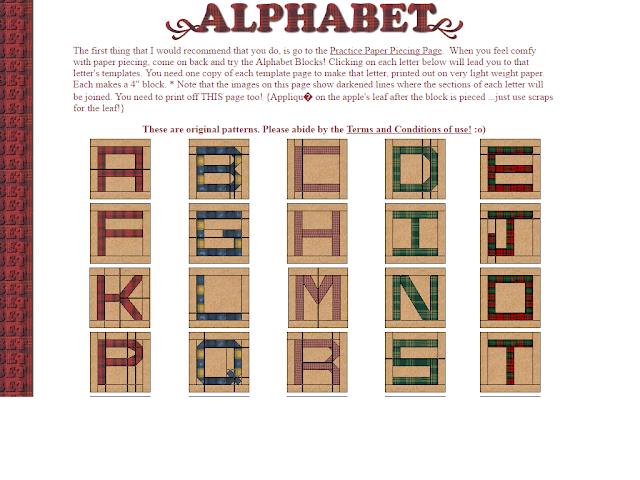 Future ideas: Christmas Words The Quilters Cache has a paper pieced free alphabet pattern here. I may combine some Christmas words with this UFO I'm not sure what to do with yet. Thanks for stopping by Christmas Corner and Happy Easter! These pouches so cute. The fabrics are beautiufl. What great finishes! I'm sure the recipients will love them. Your Christmas tree UFO is so pretty.